Well, that is an astounding admission from a leading evolutionist! But note that he tried to remove some of the sting by charging creationists with loading the audience with our own people. That is simply not true. In fact, the opposite is true. I know of no debate where the audience has been loaded with creationists. I have debated university professors on affirmative action, homosexuality, sexual permissiveness, etc., and have never had more than three or four people in large audiences who agreed with my position (to my knowledge). We creationists do not “load” the audience (not that I’m above such a thing). It’s only that it is very difficult or impossible to do in a secular university. No, Eldredge was wrong. They lose the debates because they have taken the wrong side of the argument! The unfair, unreasonable, unacceptable, unblushing, unbecoming, uncivil, unconscionable, and ungentlemanly tactics of evolutionists are obvious to all who have seen them in debates or read their books and articles. (Leading evolutionist Stephen J. Gould, now deceased and no longer an evolutionist, called creationists, “kooky,” “yahoos” and “latter-day antediluvians” and he characterized scientific creationism as “the nonsense term of the century.”) However, Steve refused to make those charges in public debate where informed creationists would make him look like a “yahoo.” He declared, “Creationist-bashing is a noble and necessary pursuit these days.” Steve seemed to hate creationists because he obviously hated our God. Richard Dawkins calls us feeble-minded, pathetic, and intellectual cavemen in his book, The Blind Watchmaker. He also wrote: “It is absolutely safe to say that if you meet somebody who claims not to believe in evolution, that person is ignorant, stupid or insane (or wicked, but I’d rather not consider that).” Then in a November 1983 article, published in the Times Literary Supplement, Dawkins called us a “gang of ignorant crackpots.” See what I mean when I say that many evolutionists are as mean as a junk-yard dog? Like Gould, Asimov, Dawkins, et al., H. L. Mencken was a writer with bile problems and hatred toward creationists. He used the Scopes Trial as a showcase for his vindictive, vicious, and vitriolic journalism. He gave “thanksgiving” that creationist William Jennings Bryan had not been elected President of the United States, although he was not thrilled with Coolidge. After ridiculing Coolidge, he referred to the Scopes Trial and ridiculed Bryan and Christians everywhere. He suggested that we believe the Earth is square (we don’t, but some of us believe his head was), witches should be put to death and Jonah swallowed the whale! Mencken was a hater of God and of creationists and he was a better word-smith than he was a thinker! 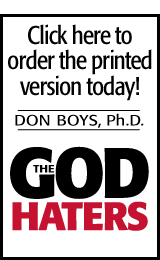 Evolutionists hate creationists and anyone who believes that the Bible is the authoritative Word of God. They are as uncomfortable as a dog in hot ashes when we talk of personal accountability to a sovereign God. They are bigots and haters with few exceptions. Please remember that they are the ones who believe incredibly silly things without any scientific data to support their philosophy and religion. They are often arrogant, asinine, and audacious. Now, with the above evidence proving that evolutionists are not the loving, kind, gracious, thoughtful, and amiable people they profess to be, I am said to be “too militant” in my approach to this issue. We are in a war, and evolutionists are the enemy. They are after another generation of children, and your tax dollars are funding their nonsense and their non-science.